Take Long Island Expressway east to exit 53, Sagtikos Parkway south. At end of Sagtikos Parkway, bear left onto Southern State Parkway east. Which becomes Heckscher State Parkway. Take Belt Parkway east or Cross Island Parkway south to Southern State Parkway east, which becomes Hecksher Parkway. Then Exit 45E, Route 27A - Montauk Highway east. At first light, turn right onto Great River Road. Follow 1 ½ miles until course entrance. 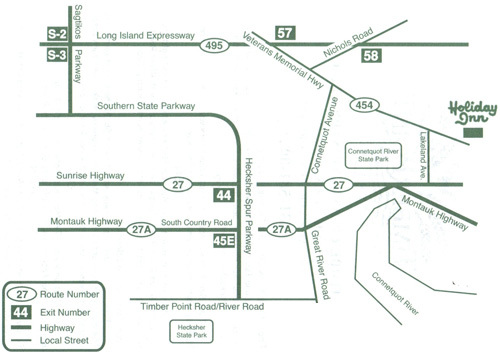 Take Long Island Expressway west to exit 58, Nichols Road South to Sunrise Hwy W to exit 46 S (Connetquot Ave), Connetquot Ave turns into Great River Rd when it crosses 27A, follow 1 ½ miles until course entrance. Go West on Route 27A-Montauk Highway. At first light past Bayard Cutting Arboretum, turn left onto Great River Road, follow 1 ½ miles until course entrance.